Here, we numerically simulate the propagation of soliton pulses in a passive fiber. Due to the delayed nonlinear response of the fiber, there is the effect of stimulated Raman scattering. The lower-frequency parts of the soliton spectrum are amplified via Raman scattering at the expense of the higher-frequency parts. As a result, we obtain a self-frequency shift of the solitons. 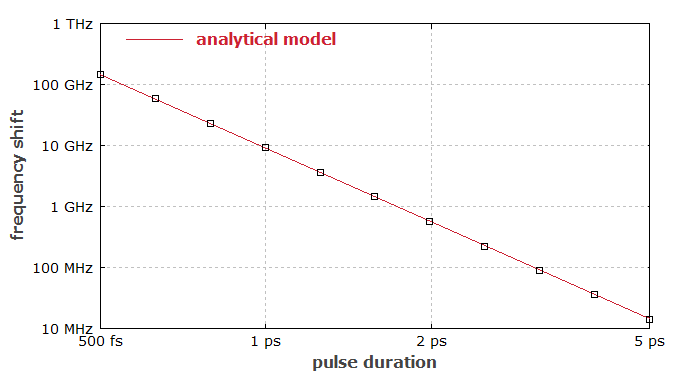 Figure 1 shows the magnitude of the self-frequency shift in a fixed length of fiber (500 m) as a function of the initial pulse duration. The results are compared with those from an analytical calculation (see J. P. Gordon, “Theory of the soliton self-frequency shift”, Opt. Lett. 11 (10), 662 (1986)), and agree well with these. Figure 1: Magnitude of soliton self-frequency shift as a function of the pulse duration. The rectangles show numerically simulated values, while the line resulted from an analytical calculation. Of course, the numerical model could easily be modified to take into account propagation losses or amplifier gain, higher-order dispersion, etc. Also, it would be possible to use any given Raman response function (determining the Raman gain spectrum).